Because Uruguay is such a small country, everything is within driving distance! Time your vacation with Uruguay's native festivals. First week of february: "Las Llamadas"
Come experience the carnival in Montevideo with the famous celebrated Candombe rhythmic music. Each year, the celebration occurs during the first week of February. Carnival Week is considered the annual national festival of the nation. 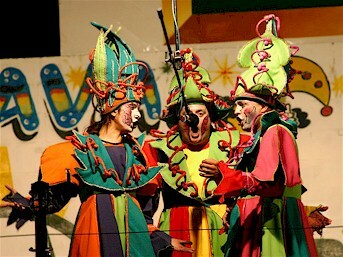 The festival is famous for the Las Murgas, small theatrical productions; each neighborhood has it's own group. Candombe is the traditional drumming of the Afro-Uruguayan people living in the city of Montevideo, where this music was born. Its heavy African influence is unmistakable, and is one of the few rhythms in South America that reflects its African roots and is embraced by the country for its cultural importance. Born in the Barrios in the city of Montevideo, Candombe is the heart beat of Carnival in Uruguay. 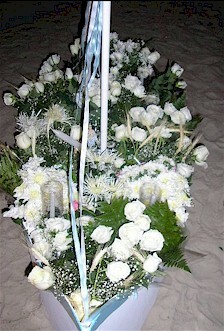 On February 2, each year, the Festival of Iemanja is celebrated in both Montevideo and Punta Del Este. 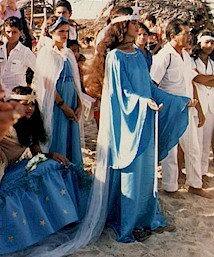 On this day, thousands of people gather at different beaches to honor Iemanja and receive her blessing and protection. Not only devotees will attend, every year more and more curious people will stop by to watch the festivity. They start arriving in the afternoon and they will leave late at night, around 3 in the morning. Celebrants are mostly dressed in white or light blue and they will make different kinds of offers to the goddess. The most common offers are flowers, watermelons and candles. However, some people go a little further by making sand sculptures or small boats that will carry a sculpture of her and will be full of fruits and foods of different kinds, money, candles and whatever you can imagine. folklore music. There are all types of contests and competitions. Traditional food is cooked outdoors in barbeque type pits called parrillas. 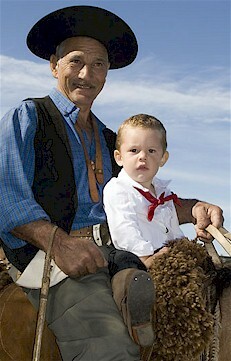 Men, women, and children dress in traditional Gaucho garb. After the multitude of activities during the day, you can enjoy one of the many shows featuring song, dance, and poetry. This experience is unique in all the world; if you want to learn, interact, and witness local color and tradition, this is an adventure you will never forget. And bring your camera! This Tango festival honors Carlos Gardel, known in Uruguay as the originator of the Tango. The week of festivities takes place in Gardel's birthplace of Tacuarembo during the week of June 24th. The entire town comes alive with parties, dancing, and celebrations. There is even a museum dedicated to the life and times of Gardel. It seems that only one individual could have epitomized the true spirit and evolution of the Tango. Carlos Gardel was blessed with unusual charisma and finely-tuned sensibilities. His modesty, humility and generosity engaged everyone who met him. He was both shy and powerful - women loved him and followed him, though he never found the one ‘woman of his heart’. He seemed to forever belong to the people. His eternal smile reminds us of that.